Franken Cash is a fun online video slot machine game released in September 2007 and it is offered exclusively at online casinos powered by Microgaming. This online video slot game has 5 reels and 20 pay lines. The theme of Franken Cash is inspired by the novel written by Mary Shelley about a weird scientist named Victor Frankenstein, who creates a monstrous creature in an eccentric scientific experiment. The Frankenstein novel may be quite scary and serious, but fear not, as this particular slot game will surely not scare you at all, as “Franken” here is very friendly and generous – he’ll even reward you with 120x your total bet by giving him a good jolt in the Franken Cash Electrifying Bonus Feature game! Not only that, your winning combinations formed during the 15 Free Spins will all be doubled! 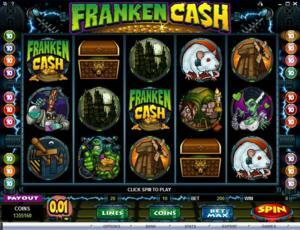 Get to meet Dr. Frankenstein, Igor, Franken’s girlfriend and other weird experiments in the Franken Cash online slot game! With a jackpot win of $25,000, you’ll surely want to be on Franken’s good side! Microgaming online slot games are available to players in 2 formats – download and no-download. Whether you like to download their software first or you prefer to play instantly without the need to download, then Microgaming surely has online slot machine games to accommodate your every slot gaming preference. Franken Cash belongs to the download category of Microgaming slot games, which means you are required to download first before you can play this particular slot game. If you are someone who is familiar with Frankenstein, enjoys watching the cartoon “The Grimm Adventures of Billy and Mandy”, and/or you like to dress up as a monster during Halloween, then Franken Cash will surely entertain you! The Franken Cash online video slot game features scatter wins, 2 fun Bonus Feature games (Free Spin Bonus Feature game and the Franken Cash Electrifying Bonus Feature game, a maximum coin jackpot of 25,000, a maximum cash jackpot of $25,000, and it has a 96% payout ratio! The quality of the graphics and sounds that Microgaming provides is extremely brilliant and superb. They have a solid reputation of making the most stunning graphics and awesome sound effects that will truly transport you to “that specific theme” they used in any of their slot games. Most people love to play games run by Microgaming software because they have smooth animation and engaging yet non-interfering sounds. In Franken Cash, they bring players to the scarily dark tower of a mad scientist named Dr. Frankenstein, where different types of weird creatures are created by odd and unorthodox ways. The symbols are drawn in a ghoulish-cartoonish manner, and even if some are monsters, you will certainly not feel scared at all because they are pretty much in the mood to be friends with you and have a great time! Help the Mad Scientist concoct in his lab, ask Igor where your room is, dodge the flirtatious gestures of Franken’s bridge, and enjoy the company of Franken Cash himself as he can give you substantial rewards if he sees you’re not like other people who judge him because he’s different (or he has different human parts). All symbols are stunningly animated when they are included in winning combinations, and even if this game mostly has dark colors in it, you will definitely not strain your eyes when you play this game for a long time. The overall graphic design of Franken Cash displays mostly the color black and blue. Other colors used are purple, green, red, gold, brown, white and yellow. Since the setting of this slot game is at the tower home of Franken Cash’s maker, you will hear comical phantom organ sounds of Transylvania-like themed music while playing the game. When you spin the reels and form winning combinations, celebratory dark-themed sound effects will be heard. For instance, if you hit winning combinations with Franken Cash, you will hear a deep throaty laugh from him. If you get a winning combination with the Windmill or Franken Cash Logo symbol, lightning sound effects will be played out. There are no card deck symbols available in the Franken Cash online video slot game. The symbols that you will find in Franken Cash are: the Franken Cash Logo, Franken Cash Celebrates, Bride of Franken Cash, Mad Scientist, Igor, Lab Rat, Brain, Windmill, Two Towers, and the Chest. There is no Wild Symbol in the Franken Cash online video slot machine game. There are 2 Scatter Symbols in the Franken Cash online slot game: the Electric Chair and the Switch symbols. These scatter symbols are not required to appear in a line (on an enabled pay line) for you to win. • Electric Chair scatter symbol – Appears in any position on the reels. When you get 2 or more Electric Chair scatter symbols (scattered from left to right in consecutive order) in a single spin, you will trigger the Franken Cash Electrifying Bonus Feature game. • Switch scatter symbol – Appears in any position on the reels. When you get 3 or more Switch scatter symbols (scattered from left to right in consecutive order) in a single spin, you will trigger the Free Spin Bonus Feature game. Your winnings are calculated by multiplying the Electric Chair or Switch scatter symbol combination payout (refer to the Payout table) by the total number of coins you’ve bet. Winning Electric Chair scatter symbol combinations are paid out from left to right, as long as there are 2 or more of these scatter symbols come out on the reels in consecutive order. Winning Switch scatter symbol combinations are paid out from left to right, as long as there are 3 or more of these scatter symbols come out on the reels in consecutive order. Please take note that if you get a scatter win and a regular win, then you are paid out for both of these wins, because the Electric Chair and Switch scatter symbol is not required to come out on an enabled pay line for you to win. Scatter awards are independent from pay line awards; therefore, they are added to the pay line win. If you get 3 or more Switch scatter symbols scattered from left to right in consecutive order, you will trigger the Free Spin Bonus Feature game. You will be rewarded 15 Free Spins, and all of the winning combinations you form during the Free Spins will be generously doubled! If you manage to get another 3 or more Switch scatter symbols (anywhere on the reels) from left to right in consecutive order while playing the Free Spin games, you will win a bonus multiplier on your total bet! You cannot re-trigger the Free Spin Bonus Feature game nor can you trigger the Franken Cash Electrifying Bonus Feature game while playing the Free Spins. Please take note that since the Switch is a scatter symbol, your winnings are calculated by multiplying the Switch scatter symbols combination payout (refer to payout table) by the total number of coins you’ve bet. When the Free Spin Bonus Feature game is over, you will be then taken back to the main Franken Cash online slot game, and your winnings from the Free Spin games will be included to your win total. If you get 2 or more Electric Chair scatter symbols scattered from left to right in consecutive order, you will trigger the Franken Cash Electrifying Bonus Feature game. In the Franken Cash Electrifying Bonus Feature game, you are going to choose Voltage Meters that can reward you with random multiplier amounts. You are presented 12 voltage meters from which you are going to choose only 3. Your total bet amount is multiplied by the sum of the random multiplier amounts you’ve won. You can win up to 120x your total bet in the Franken Cash Electrifying Bonus Feature game! Please take note that since the Electric Chair is a scatter symbol, your winnings are calculated by multiplying the Electric Chair scatter symbols combination payout (refer to payout table) by the total number of coins you’ve bet. When the Franken Cash Electrifying Bonus Feature game is over, you will be then taken back to the main Franken Cash online slot game, and your winnings from the bonus game will be included to your win total. Franken Cash has 5 reels where you may bet on 20 pay lines. The minimum bet is 0.01 and the maximum bet is 1.00 per pay line. You can wager 1 up to 10 coins per pay line bet. Therefore, the maximum bet amount is 200.00 per spin. Please take note that the amounts mentioned are in Pounds, but they will remain the same if you choose to play in US dollars, Euros, or Canadian dollars. Also, for every coin that you wager, you will enable another pay line. You will be paid out for winning combinations on enabled pay lines only. The maximum payout in the regular Franken Cash online video slot game is 2,500 coins per line bet. People who regularly play online casino games naturally love to stay longer on online slot games that have an Autoplay function. Good thing that Franken Cash is furnished with this function! In Microgaming online slot games, they have 2 game modes – Regular mode and Expert mode. You can have the game spin automatically for you with the Autoplay function that can be found by clicking the Expert button (if you look closely at the brown line at the bottom part of the game screen, you will see the Expert button just below the Bet Max button). After customizing the Autoplay function to your preferences, just click on the Start button, and the game will automatically spin for you while you just sit back, relax, and enjoy playing this comical Frankenstein-themed online video slot game!